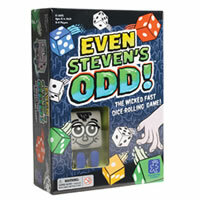 Even Steven's Odd is a fast acting game where players will need to match the specific challenge card with their dice and be the first to grab the squishy Steven doll. Do this until you have earned the most cards and you'll be the winner. Great for younger kids and a blast for adults. Winning multiple awards, the dice game Even Steven's Odd is just as educational as it is fun. Players will be tested with their math skills, their quick hands and their fast thinking. With two different levels of challenges, easy and hard, you can adapt this game to be played by just about anyone. See what all the fun is about by purchasing your own copy of Even Steven's Odd. You'll win if you can earn the most cards. 24 dice, 40 dice challenge cards, 4 dice holders, Steven and the official Even Steven's Odd game rules and instructions will come with this game. Please keep in mind that the official Even Steven's Odd dice-card rules and instructions could be different depending on the game version you have. The rules below are some of the exact directions on how to play Even Steven's Odd. Share with us your comments, funny stories, tips, advice, strategies, creative ways to play, questions about how to play, problems with the rules or anything you want about Even Steven's Odd. All submissions will be reviewed within 24 hours. Click here to add your Even Steven's Odd comments.